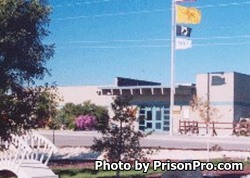 The Lea County Correctional Facility is a privately run prison under a contract with the New Mexico Department of Corrections and The GEO Group, Inc. It is a medium security prison that houses 1,200 adult male offenders. The prison itself is situated on a former air base used during WWII as a B-17 training base. The prison is secured by two fences and a microwave intrusion detection system. Inmates are housed in either double cells, or single cells. Lea County Correctional Facility has a four medium security housing units, and a maximum security housing unit. While incarcerated here offenders can participate in educational programs to earn a GED and vocational programs to learn a new workplace skill. Additionally, inmates can receive mental health, and substance abuse treatment. All visitors must be on the inmate's approved visitation list prior to visiting the facility. Wednesdays, Thursdays, Fridays, Saturdays and Holidays from 8:30am-3:30pm. Sundays, Mondays, and Tuesdays from 8:30am-3pm.